PSAR dot is above the price - downtrend. PSAR dot is below the price - uptrend. 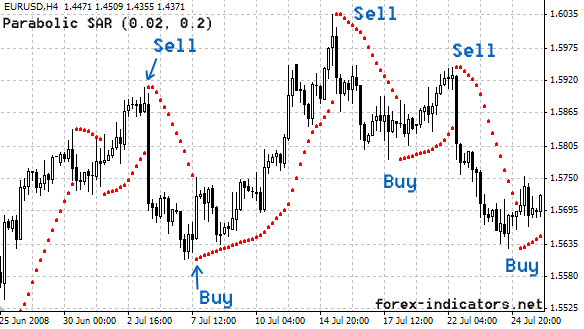 Parabolic SAR indicator is a trend indicator, which tells Forex traders about price stop-and-reverse points as well as trend direction. Its concept of usage is easy to understand from the first look. Parabolic SAR appears as a set of dotted lines, where each dot represents certain time period. When price is above Parabolic SAR dots, Forex traders should be holding Long positions only. Once Parabolic SAR dots come on top of the price - it is time to change trading positions to Short. Parabolic Sar indicator literally allows being in trade all the time. However, trading with Parabolic SAR is not that simple; not all Parabolic SAR reversal signals can be traded profitably. Let's turn to advice given by the developer of Parabolic SAR indicator - J. Welles Wilder. He suggests using Parabolic SAR, first of all, for trailing stops and finding the best exits. The way Forex traders use Parabolic SAR is by simply setting a Stop loss order at the level of the most recent SAR dot appearing on the chart. Stop is then trailed along with each new Sar dot till trend remains intact. Once Parabolic SAR indicator changes its position - SAR dots appear on the opposite side of the price - the trade is closed. Welles Wilder doesn't recommend using Parabolic SAR as a stand alone indicator. The main reason for that is: Parabolic SAR can easily create whip-saws (false signals) during periods of market consolidation. The Parabolic SAR works best during strong trending periods, which Wilder himself estimates occur roughly 30% of the time. 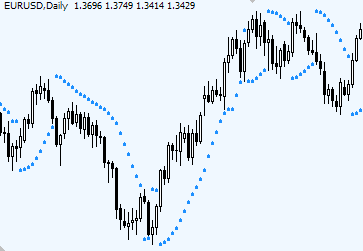 Thus Forex traders will need other Forex indicators to identify those strong trending periods. For himself, Welles Wilder developed ADX indicator - another trend indicator - which tells what kind of trend is dominant and how strong the trend is. Upon knowing the trend and its health Forex traders can pick appropriate signals from Parabolic SAR and disregard the rest. How do you determine the trend if you don't want to use ADX. Try 50 EMA. Price readings above it would suggest an uptrend, below - downtrend. So, Parabolic SAR is developed to keep stop loss level moving adjusting to new prices and thus locking profits on its way. The formula of Parabolic SAR includes an "acceleration factor", which allows to react to market changes fast as the trend starts to accelerate. At the beginning, new Parabolic SAR dots are placed close together and then accelerate as the trend advances. Parabolic SAR has two variables: a step and max step. Settings recommended by W.Wilder are: a step of 0.02 and the max step of 0.2. The step sets sensitivity of Parabolic SAR indicator. If the Step is too high, Parabolic SAR becomes more sensitive and will flip back and forth more often, with lower step Parabolic SAR will become smoother. Maximum step sets a cushion between price and Parabolic SAR. The higher the max step the closer the trailing stop will be to the price. When space between Parabolic SAR dots increases significantly, it indicates that acceleration formula for SAR is already working. Thus, if you have missed out on an entry, it might be better to avoid late entries at all and rather wait for an opportunity to re-enter the trade with a help of, for example, Stochastic indicator. Parabolic SAR is only a mathematical interpretation of the price. Even though it helps to identify initial place for a Stop, it may not be the final or best one sometimes. Forex traders who also look at support/resistance levels, round numbers, trend line etc may find even better place for Stops to be set. After 15 sites the best formula and example of SAR. I love your website! the best and clearest explanations of indicators anywhere on the net!! that's because I TRADE with those indicators, not just TALK about them. This is the best explanation on PSAR I can found. One issue to clear up: Is L(t) same as Low(t), H(t) same as High(t) ? Good explanation of SAR and many other indicators, thank you. Easy to understand and useful. The parabolic Sar explanation is very clear... i will give it a try.... thanks a million. Really usefull information regarding PSAR, few new things which I never knew. Sorry, the formula is complicated even for me. Anyone else? Don't stop talk about indicators... You helps us a lot. In 5 step there is a little mistake: we must use SAR(t-1) to calculate AFD, not SAR(t). Sir, can you please explai the parameters for SAR on 60min and/or dlay chart for swing trading?